Technical fouls: Brescia-None. Murray St.-None. Points in the paint-BRESCIA 24,MUR 52. Points off turnovers-BRESCIA 16,MUR 22. 2nd chance points-BRESCIA 10,MUR 10. Fast break points-BRESCIA 2,MUR 16. Bench points-BRESCIA 29,MUR 40. Score tied-0 times. Lead changed-0 times. Last FG-BRESCIA 2nd-01:22, MUR 2nd-00:25. Largest lead-BRESCIA None, MUR by 57 2nd-06:17. BRESCIA led for 00:00. MUR led for 39:46. Game  was tied for 00:14. Middle Tenn. vs Murray St.
Technical fouls: Middle Tenn.-None. Murray St.-None. Points in the paint-MT 28,MUR 32. Points off turnovers-MT 11,MUR 22. 2nd chance points-MT 4,MUR 15. Fast break points-MT 4,MUR 6. Bench points-MT 23,MUR 20. Score tied-11 times. Lead changed-7 times. Last FG-MT 2nd-00:28, MUR 2nd-00:46. Largest lead-MT by 6 2nd-03:22, MUR by 6 1st-14:10. MT led for 16:00. MUR led for 18:14. Game  was tied for 05:46. Murray St. vs Wright St.
Technical fouls: Murray St.-None. Wright St.-None. Points in the paint-MUR 28,WRSTM 24. Points off turnovers-MUR 21,WRSTM 18. 2nd chance points-MUR 10,WRSTM 12. Fast break points-MUR 6,WRSTM 0. Bench points-MUR 19,WRSTM 13. Score tied-7 times. Lead changed-5 times. Last FG-MUR 2nd-00:25, WRSTM 2nd-04:44. Largest lead-MUR by 19 2nd-00:25, WRSTM by 4 1st-17:11. MUR led for 31:03. WRSTM led for 04:34. Game  was tied for 04:23. Southern Ill. vs Murray St.
Technical fouls: Southern Ill.-Lloyd,Sean. Murray St.-MILLER, JR., Terrell. Points in the paint-SIU 32,MUR 36. Points off turnovers-SIU 12,MUR 11. 2nd chance points-SIU 9,MUR 11. Fast break points-SIU 0,MUR 6. Bench points-SIU 18,MUR 15. Score tied-6 times. Lead changed-9 times. Last FG-SIU 2nd-00:17, MUR 2nd-00:05. Largest lead-SIU by 8 1st-04:39, MUR by 8 2nd-00:05. SIU led for 18:47. MUR led for 17:10. Game  was tied for 04:03. Technical fouls: Harris-Stowe-None. Murray St.-None. Points in the paint-HSSU 22,MUR 32. Points off turnovers-HSSU 7,MUR 29. 2nd chance points-HSSU 9,MUR 13. Fast break points-HSSU 4,MUR 14. Bench points-HSSU 20,MUR 27. Score tied-0 times. Lead changed-0 times. Last FG-HSSU 2nd-00:19, MUR 2nd-02:37. Largest lead-HSSU None, MUR by 36 2nd-03:39. HSSU led for 00:00. MUR led for 39:39. Game  was tied for 00:15. Florida A&M vs Murray St.
Technical fouls: Florida A&M-None. Murray St.-None. Points in the paint-FAMUM 22,MUR 50. Points off turnovers-FAMUM 4,MUR 16. 2nd chance points-FAMUM 6,MUR 23. Fast break points-FAMUM 2,MUR 12. Bench points-FAMUM 11,MUR 19. Score tied-1 time. Lead changed-6 times. Last FG-FAMUM 2nd-01:16, MUR 2nd-00:54. Largest lead-FAMUM by 3 1st-11:52, MUR by 26 2nd-05:46. FAMUM led for 03:13. MUR led for 36:18. Game  was tied for 00:29. Murray St. vs Illinois St.
Technical fouls: Murray St.-None. Illinois St.-None. Fouled out: Home #25 (Williams) 2nd 0:20. Points in the paint-MUR 32,ILS 16. Points off turnovers-MUR 11,ILS 10. 2nd chance points-MUR 10,ILS 11. Fast break points-MUR 5,ILS 5. Bench points-MUR 9,ILS 12. Score tied-0 times. Lead changed-1 time. Last FG-MUR 2nd-01:26, ILS 2nd-01:06. Largest lead-MUR by 13 2nd-15:37, ILS by 9 1st-12:52. MUR led for 26:48. ILS led for 12:07. Game  was tied for 01:05. Technical fouls: Murray St.-BUCHANAN, Shaq. Saint Louis-FRENCH, Hasahn. Points in the paint-MUR 26,SLU 30. Points off turnovers-MUR 5,SLU 16. 2nd chance points-MUR 10,SLU 11. Fast break points-MUR 15,SLU 12. Bench points-MUR 8,SLU 7. Score tied-2 times. Lead changed-1 time. Last FG-MUR 2nd-01:01, SLU 2nd-01:31. Largest lead-MUR by 13 1st-14:19, SLU by 18 2nd-08:58. MUR led for 20:19. SLU led for 17:54. Game  was tied for 01:47. Technical fouls: Marist-None. Murray St.-None. Points in the paint-MAR 14,MUR 46. Points off turnovers-MAR 6,MUR 24. 2nd chance points-MAR 5,MUR 11. Fast break points-MAR 0,MUR 12. Bench points-MAR 17,MUR 34. Score tied-0 times. Lead changed-4 times. Last FG-MAR 2nd-00:57, MUR 2nd-00:42. Largest lead-MAR by 5 1st-17:05, MUR by 39 2nd-05:28. MAR led for 02:46. MUR led for 36:13. Game  was tied for 01:01. Technical fouls: Auburn-None. Murray St.-None. Points in the paint-AU 26,MUR 30. Points off turnovers-AU 8,MUR 9. 2nd chance points-AU 20,MUR 18. Fast break points-AU 0,MUR 6. Bench points-AU 11,MUR 3. Score tied-5 times. Lead changed-7 times. Last FG-AU 2nd-01:07, MUR 2nd-00:01. Largest lead-AU by 8 2nd-00:44, MUR by 10 1st-16:22. AU led for 24:52. MUR led for 10:57. Game  was tied for 04:11. Technical fouls: Murray St.-None. Detroit Mercy-None. Points in the paint-MUR 36,DETMERCY 26. Points off turnovers-MUR 11,DETMERCY 6. 2nd chance points-MUR 8,DETMERCY 7. Fast break points-MUR 22,DETMERCY 6. Bench points-MUR 13,DETMERCY 30. Score tied-1 time. Lead changed-6 times. Last FG-MUR 2nd-01:18, DETMERCY 2nd-00:15. Largest lead-MUR by 10 2nd-13:28, DETMERCY by 2 1st-17:03. MUR led for 37:43. DETMERCY led for 01:28. Game  was tied for 00:49. Eastern Ill. vs Murray St.
Technical fouls: Eastern Ill.-DAMA, Muusa. Murray St.-None. Points in the paint-EIU 24,MUR 40. Points off turnovers-EIU 11,MUR 6. 2nd chance points-EIU 9,MUR 16. Fast break points-EIU 0,MUR 8. Bench points-EIU 11,MUR 16. Score tied-1 time. Lead changed-2 times. Last FG-EIU 2nd-08:42, MUR 2nd-00:57. Largest lead-EIU by 1 1st-16:23, MUR by 28 2nd-02:34. EIU led for 00:52. MUR led for 37:51. Game  was tied for 01:17. Technical fouls: SIUE-None. Murray St.-None. Points in the paint-SIUE 16,MUR 30. Points off turnovers-SIUE 13,MUR 9. 2nd chance points-SIUE 7,MUR 10. Fast break points-SIUE 0,MUR 0. Bench points-SIUE 35,MUR 26. Score tied-2 times. Lead changed-3 times. Last FG-SIUE 2nd-02:33, MUR 2nd-00:38. Largest lead-SIUE by 2 1st-19:18, MUR by 25 2nd-05:02. SIUE led for 01:39. MUR led for 37:04. Game  was tied for 01:17. Southeast Mo. St. vs Murray St.
Technical fouls: Southeast Mo. St.-CARPENTER, Justin. Murray St.-TEAM. Points in the paint-SEMO 30,MUR 40. Points off turnovers-SEMO 15,MUR 23. 2nd chance points-SEMO 11,MUR 6. Fast break points-SEMO 4,MUR 8. Bench points-SEMO 23,MUR 9. Score tied-2 times. Lead changed-4 times. Last FG-SEMO 2nd-00:16, MUR 2nd-01:43. Largest lead-SEMO by 3 1st-16:26, MUR by 22 2nd-04:41. SEMO led for 04:12. MUR led for 33:45. Game  was tied for 01:30. UT Martin vs Murray St.
Technical fouls: UT Martin-None. Murray St.-None. Points in the paint-UTM 42,MUR 30. Points off turnovers-UTM 11,MUR 15. 2nd chance points-UTM 6,MUR 15. Fast break points-UTM 4,MUR 8. Bench points-UTM 14,MUR 20. Score tied-1 time. Lead changed-1 time. Last FG-UTM 2nd-00:32, MUR 2nd-02:06. Largest lead-UTM by 2 1st-19:16, MUR by 28 2nd-07:09. UTM led for 01:41. MUR led for 37:12. Game  was tied for 01:07. Murray St. vs Jacksonville St.
Technical fouls: Murray St.-MILLER, JR., Terrell. Jacksonville St.-None. Points in the paint-MUR 28,JSU 34. Points off turnovers-MUR 9,JSU 22. 2nd chance points-MUR 8,JSU 8. Fast break points-MUR 2,JSU 14. Bench points-MUR 11,JSU 23. Score tied-1 time. Lead changed-1 time. Last FG-MUR 2nd-00:07, JSU 2nd-02:20. Largest lead-MUR by 4 1st-18:49, JSU by 19 2nd-13:54. MUR led for 02:39. JSU led for 35:50. Game  was tied for 01:31. Points in the paint-MUR 32,TTU 38. Points off turnovers-MUR 13,TTU 20. 2nd chance points-MUR 16,TTU 2. Fast break points-MUR 11,TTU 6. Bench points-MUR 15,TTU 13. Score tied-0 times. Lead changed-0 times. Last FG-MUR 2nd-00:44, TTU 2nd-05:09. Largest lead-MUR by 26 2nd-00:44, TTU None. MUR led for 39:46. TTU led for 00:00. Game  was tied for 00:14. Technical fouls: Murray St.-None. Belmont-None. Points in the paint-MUR 32,BEL 28. Points off turnovers-MUR 12,BEL 8. 2nd chance points-MUR 18,BEL 11. Fast break points-MUR 0,BEL 4. Bench points-MUR 17,BEL 25. Score tied-5 times. Lead changed-11 times. Last FG-MUR 2nd-00:11, BEL 2nd-00:17. Largest lead-MUR by 5 1st-15:40, BEL by 13 2nd-02:47. MUR led for 16:28. BEL led for 19:42. Game  was tied for 03:50. Murray St. vs Tennessee St.
Technical fouls: Murray St.-None. Tennessee St.-None. Points in the paint-MUR 24,TSUM 28. Points off turnovers-MUR 13,TSUM 5. 2nd chance points-MUR 11,TSUM 19. Fast break points-MUR 10,TSUM 0. Bench points-MUR 14,TSUM 15. Score tied-3 times. Lead changed-3 times. Last FG-MUR 2nd-00:37, TSUM 2nd-01:37. Largest lead-MUR by 19 2nd-00:37, TSUM by 3 1st-18:42. MUR led for 31:20. TSUM led for 05:23. Game  was tied for 03:17. Morehead St. vs Murray St.
Technical fouls: Morehead St.-TEAM. Murray St.-MILLER, JR., Terrell. Points in the paint-MOR-M 34,MUR 40. Points off turnovers-MOR-M 23,MUR 6. 2nd chance points-MOR-M 15,MUR 17. Fast break points-MOR-M 9,MUR 4. Bench points-MOR-M 27,MUR 2. Score tied-1 time. Lead changed-2 times. Last FG-MOR-M 2nd-00:13, MUR 2nd-01:40. Largest lead-MOR-M by 1 2nd-06:25, MUR by 15 1st-02:19. MOR-M led for 00:17. MUR led for 39:12. Game  was tied for 00:31. Eastern Ky. vs Murray St.
Technical fouls: Eastern Ky.-None. Murray St.-None. Points in the paint-EKU 42,MUR 40. Points off turnovers-EKU 12,MUR 12. 2nd chance points-EKU 5,MUR 8. Fast break points-EKU 8,MUR 10. Bench points-EKU 14,MUR 27. Score tied-1 time. Lead changed-2 times. Last FG-EKU 2nd-00:16, MUR 2nd-00:32. Largest lead-EKU by 4 1st-13:27, MUR by 21 2nd-11:20. EKU led for 05:09. MUR led for 34:06. Game  was tied for 00:45. Murray St. vs Southeast Mo. St.
02-01-18 7:30 p.m. at Show Me Center -- Cape Girardeau, Mo. Technical fouls: Murray St.-None. Southeast Mo. St.-None. Points in the paint-MUR 34,SEMO 36. Points off turnovers-MUR 18,SEMO 8. 2nd chance points-MUR 14,SEMO 14. Fast break points-MUR 2,SEMO 2. Bench points-MUR 16,SEMO 2. Score tied-1 time. Lead changed-1 time. Last FG-MUR 2nd-02:00, SEMO 2nd-01:13. Largest lead-MUR by 13 2nd-00:40, SEMO by 13 1st-10:08. MUR led for 08:38. SEMO led for 30:43. Game  was tied for 00:39. 2/3/18 6:10 p.m. at Elam Center - Martin, Tenn.
Technical fouls: Murray St.-None. UT Martin-None. Points in the paint-MUR 22,UTM 18. Points off turnovers-MUR 20,UTM 5. 2nd chance points-MUR 7,UTM 2. Fast break points-MUR 6,UTM 3. Bench points-MUR 9,UTM 21. Score tied-8 times. Lead changed-18 times. Last FG-MUR 2nd-00:04, UTM 2nd-09:41. Largest lead-MUR by 13 2nd-00:04, UTM by 4 1st-11:20. MUR led for 19:44. UTM led for 16:51. Game  was tied for 03:25. Austin Peay vs Murray St.
Technical fouls: Austin Peay-None. 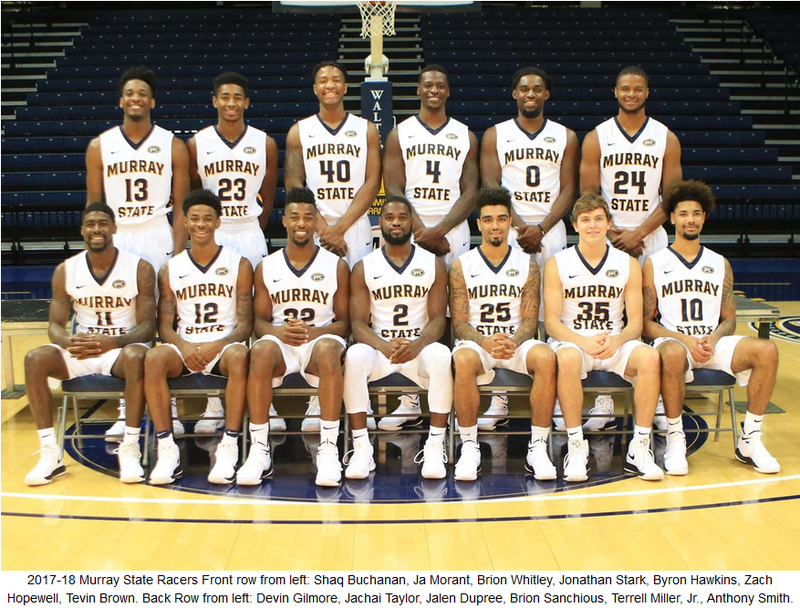 Murray St.-TEAM. Points in the paint-APSU 32,MUR 42. Points off turnovers-APSU 14,MUR 21. 2nd chance points-APSU 9,MUR 3. Fast break points-APSU 2,MUR 14. Bench points-APSU 23,MUR 18. Score tied-0 times. Lead changed-0 times. Last FG-APSU 2nd-02:34, MUR 2nd-00:35. Largest lead-APSU None, MUR by 21 2nd-00:35. APSU led for 00:00. MUR led for 39:47. Game  was tied for 00:13.
the CFSB Center in Murray, Ky.
into a share of first place with Belmont who was upset at Tennessee State. Edwardsville, Illinois on Fox Sports Midwest. 14 points off the bench to pace the Racers to their seventh-straight home win. with 1:25 left when it was 81-62.
the field and 7-of-9 from the 3-point line. Technical fouls: Murray St.-None. SIUE-None. Jacksonville St. vs Murray St. Points in the paint-JSU 44,MUR 22. Points off turnovers-JSU 8,MUR 8. 2nd chance points-JSU 13,MUR 7. Fast break points-JSU 8,MUR 8. Bench points-JSU 14,MUR 7. Score tied-3 times. Lead changed-4 times. Last FG-JSU 2nd-00:54, MUR 2nd-00:49. Largest lead-JSU by 4 1st-14:34, MUR by 11 2nd-17:59. JSU led for 10:16. MUR led for 25:31. Game  was tied for 04:12. Tennessee Tech vs Murray St. Points in the paint-TTU 40,MUR 28. Points off turnovers-TTU 18,MUR 13. 2nd chance points-TTU 9,MUR 13. Fast break points-TTU 8,MUR 10. Bench points-TTU 3,MUR 9. Score tied-1 time. Lead changed-0 times. Last FG-TTU 2nd-00:09, MUR 2nd-04:22. Largest lead-TTU None, MUR by 16 1st-07:59. TTU led for 00:00. MUR led for 38:50. Game  was tied for 01:10. Murray, KY CFSB Center Isaiah Canaan's Jersey No 3 retired. Murray St. vs Eastern Ill.
02/22/18 7:30 pm at Charleston, Ill.
Officials: Tommy Short, Tyler Kumpf, and Tom O'Neill Jr.
Technical fouls: Murray St.-None. Eastern Ill.-None. Technical fouls: Murray St.-None. Austin Peay-None. Weather delay (3:06) with 5:49 remaining in second half. Dunn Center, Clarksville, TN Game Delayed in 2nd half for tornado. Jacksonville State vs Murray St.
Ford Center, Evansville, IN Ohio Valley Conference Tournament Semifinals <?br> 2500th game in program history. Technical fouls: Belmont-None. Murray St.-None. 03/26/18 1:15 pm at Viejas Arena, San Diego, Calif.
Technical fouls: Murray St.-None. West Virginia-None.